EMAX Compressor Tools and Equipment deliver overwhelming performance to ensure that they meet the needs of even the most demanding environments. All products are designed with exacting tolerance and specifications to deliver all the power that is needed at the Jobsite, Garage or Shop for extreme performance. All EMAX piston pumps deliver big air and include steel connecting rods and removable disc valves. Air Stream Technology insures you will have the coolest, quietest air compressor in the industry. It includes an air compressor silencer that is designed to suppress operating noise level and also acts as a filtration system to prevent foreign matter from entering the intake. 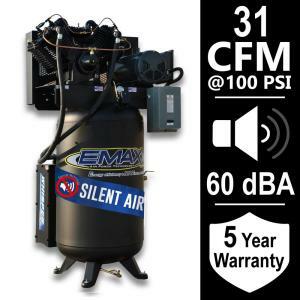 The EMAX Silent Air Industrial Air Compressor offers super-quiet low RPM with solid cast iron construction for extended life. The EMAX Compressor with built on Whisper 100 is an affordable solution to your piston compressor noise problem. The Whisper 100 dissipates compressor intake noise by channeling the intake air through baffle plates and pre-filter media within the silencer cabinet. As a result, the piston intake noise is trapped and dissipated within the silencer structure. The compressor intake filters are also located inside the Whisper 100 cabinet which further enhances noise reduction. The noise suppression system is compact and located on the back of the compressor tank. 5 year warranty on pump, motor and tank. Tbook.com crawls the web to find the best prices and availability on Industrial Hardware and related Tools and Hardware products like EMAX Industrial Series 80 Gal. 7.5 HP 1-Phase Silent Air Electric Air Compressor. For this page, related items include products we find that match the following keywords: "Industrial" at our vendor partner Home Depot. EMAX Industrial Series 80 Gal. 7.5 HP 1-Phase Silent Air Electric Air Compressor is one of 143 Industrial Hardware and related products listed in the Tools and Hardware section of Tbook.com If you have any questions on this product, please give us a call at 734-971-1210 during the hours of 9am - 5pm EST for assistance. Thank you for shopping at Tbook.com, the Internet Department Store!